Perusing through the Projo today, I started taking note of the folks who died in 2008 of special significance for many of us Narrows folks. Odetta--We did a show or two with her over the years. Very classy to work with. It was an honor for many of us at the Narrows to meet her. Maharishi Mahesh Yogi--The Beatles' guru for a time, and the alleged inspiration for several songs. Bo Diddley--In my view, this important founder of rock 'n' roll got more press when he died than in his music career. Larry Harmon--the guy who made "Bozo" a household name. Isaac Hayes--The voice. The songwriter. The soul man. Levi Stubbs--Four Tops front guy. You might not have heard of him, but you heard his music. Bob Enos--"Roomful of Blues" trumpeter. Unexpected loss to the local music community. "Amos Moses" and "When You're Hot You're Hot." Jeff Healey--I didn't see his name on the Projo's end of the year lists (there were actually two in today's paper), but he was known for "Angel Eyes" and the odd way he played guitar. If memory serves, Coco Montoya talked about his passing during his show at the Narrows. Roy Scheider--The actor who played the lead in the "Jaws" movies. I threw him on the list because your humble blogger loves the first "Jaws" movie. Studs Terkel--Radio host based in Chicago. Might be described as left-wing. Wrote the book "Working" which was an influence on your humble blogger. Harvey Korman--Loved the movie "Blazing Saddles" and therefore loved Harvey. Suzanne Pleshette--Bob Newhart's TV wife on his first show, before he ended up in Vermont. Miriam Makeba--South African singer who fought apartheid in that country and beyond. Mike Smith--the voice of "The Dave Clark Five." Snappy records that out Beatle'd the Beatles. Nick Reynolds and John Stewart--Members at one time or another of "The Kingston Trio," the group that helped launch the folk movement in the 1960s. John Stewart worked with Fleetwood Mac members to score a solo hit "Gold" in the late 1970s. Eartha Kitt--The original "Santa Baby" and much, much more. Mitch Mitchell--One of Jimi's drummers. Buddy Miles--Another one of Jimi's drummers. (Info courtesy of Rolling Stone magazine). Ivan Dixon--Played "Kinch" on "Hogan's Heroes." Loved that show. Dave McKenna--Jazz cat out of Woonsocket. Danny Federici--Springsteen's keyboard guy right from the start. Leroi Moore--Sax man for Dave Matthews. Dennis Yost--Voice of the group "Classics IV." Did the original version of "Spooky." Please add anybody I've missed. One name fortunately not on the list is local musician Jeff Olson, who damn near didn't pull through after getting hit over the summer with Legionnaires' disease. But the music community pulled together and sent him good thoughts and prayers, and held a benefit concert for him and his family. Jeff is much better these days (though still a little shaky) and recently went back to work after months of often painful recovery. Jeff--you've got a lot more music to make! Justin Townes Earle, that's right Steve Earle's son, played a great show at the Narrows in 2008. When I was walking into the Narrows I spotted a rather intense-looking young man drinking coffee and smoking just outside the door. I asked him if he was Justin, and he said yes. So I asked if I could take several shots of him on the street. Justin has wrestled some of the demons his father wrestled with, and I think this photo suggests that. Eilen Jewell continues to be one of the hottest new performers on the circuit. I missed her recent visit, but I heard she's incorporated more variety into her performance. She's continuing to evolve as an artist, and that's wonderful to see. I did catch her when she visited earlier in 2008. She was "backstage" near the old timely looking mirror when I had an inspiration and took the above photo. Since she has an old timey voice I thought the photo captured a bit of what she's all about. Your humble blogger takes photos with a modest digital camera--fairly low tech. The photos are "worked on" a bit after I take 'em, but there's not a heck of a lot I know how to do. On top of that, whether they're too bright or too dark is really subject to how you set your browser. That said--I tried to take some interesting shots during the year. Over the next few days I'll display a few of my favorites. Above, the photo is Maura Kennedy of The Kennedys as shot through another camera. I was just walking by and snapped it quickly. I like the effect. Hope you do too. Your humble blogger saw most, but not all, the shows of 2008. So my top concerts may be missing some of those I missed (e.g. Dar Williams, Johnny Winter). But of those I saw, here are the tops in no particular order (leave your list in "comments"). Shelby Lynne--absolutely fab. Great songs. Great energy. Great showmanship. Los Strait Jackets--A load of fun from these masked masters of surf. Jake Shimabukuro--Ukelele cat brought new respect for the instrument. His version of "While My Guitar Gently Weeps" is worth the price of admission. Lil' Ed--Loved the "blues ballet." Check his entry in this blog and you'll see why. Sometymes Why--A super group of top female roots artists. Loved the hand clapping part. Samuel James--great, scratching blues dude. He opened for Sonny Landreth. You probably weren't paying attention. I was. Leo Kottke--Light-hearted class all the way. Beppe Gambetta--Italian guitarist who didn't take himself too seriously. Fun. Eric Lindell--A Springsteen for the new millennium. Bettye LaVette--Soul for the ages. Judith Owen--Funny, fairly unknown jazz pianist. Very entertaining. Celtic cats Coyote Run brought glad tidings--and kilts--to the Narrows Friday night, along with step students from the Dunleavy Shaffer school of Irish dance. Narrows alum--and a Byrds and Flying Burrito Brothers founder--Chris Hillman tells his story in a new book about the Burritos. The Subdudes, sort of the Nitty Gritty Dirt Band meets The Temptations, sold out the Narrows Friday night. It was their first visit. Opener Jen Murdza, whose Elvis influence was evident, opened the show. That's her below. Civil rights folk singer, and Narrows alum, Odetta, has died. A write up from Rolling Stone here. Is This The New Face of Rock 'n' Roll? In the end, the crowd surged and jumped on the stage with the band--just a typical happening at Sarah Borges and the Broken Singles' annual post-Thanksgiving bash at the Narrows. A busload of folks from Taunton--led by Sarah's dad--stormed the Narrows to welcome the band as it wrapped up its 2008 touring schedule, after dozens of states and foreign countries. About 100 shows, according to bassist--and the new face of rock 'n' roll--Binky, pictured above. Sarah=-wearing a dress she says she bought at a Salvation Army store for a buck--introduced the group's new guitarist--an axeman with plenty of rock chops--and noted that a new CD was coming out in March 2009. From the tunes they played, it sounds like the band is moving toward a rock sound, perhaps lessening the countrified seasoning as in the past. But Saturday night was about coming home--to her family and to her friends from Taunton. Like the guy below--perhaps a Borges' relative--who ended up personally supervising Sarah as she belted out a song. Even though there's been a shuffling of some members, roots revivalist Crooked Still continues to grow its audience, playing to a packed house at the Narrows Friday night. Sarah Borges and the Broken Singles, playing their annual Thanksgiving weekend show on Saturday night, were recently featured in the New York Times. Celtic prog rockers Enter the Haggis, from Canada, made their debut Friday night at the Narrows. Mixing slamming rhythm guitar with a bagpipe, whistle, powerful drums, keyboards, fiddle and bass, the band was hard to pin down--are they Celtic? Alternative rockers? Secret metal lovers? Whatever you call it, the music was upbeat, hooky and fun. These guys are your humble blogger's favorite new band. As Iris Dement pointed out early in the show Saturday night, the concert would have started a bit earlier but was delayed because she noticed that the Narrows "has stores." So, above, she briefly did a little shopping in one of the studios until your humble blogger gently suggested it was time to start the music. The Wuffer Guffer with the Green Teeth (or whatever his nickname is) Peter Wolf stopped by the Narrows on Thursday night to watch Shelby Lynn. The word we got was that he was visiting with her in her bus before the show. He quietly came up through the usual entrance, drawing little attention, and took his seat. Of course, those of us who grew up listening to the J. Geils Band were knocked out to see him. Forget about "Centerfold" and "Love Stinks"; listen to the live "Blow Your Face Out" album and tunes like "Lookin' for a Love," "I Do," "First I Look at the Purse," and "Hard Driving Man." Fab Narrows volunteer Carl, below with the Wuffer Guffer, advises him where a wolf might get a late night bite on a Thursday night. Shelby Lynne made a fab debut at the Narrows Thursday night, bringing her soulful country musicality with more than a dash of rock 'n' roll. Her vocals were gorgeous and her band right on the mark (despite seemingly rehearsing Tony Joe's White "Polk Salad Annie" for the first time, which delighted the crowd as Shelby, tongue in cheek, coached her bandmates). It was clear by the end of the night that Ms. Lynne was loving the show as much or even more than the audience. She waved a vinyl copy of her latest recording on stage (photo above), which celebrates the late British chanteuse Dusty Springfield. We've been playing the CD version at the Narrows for months, and it's a good 'un. By the way, in the audience was one of the original bad boys from Boston, the Wuffa Guffa. More on him in the next entry. In short, Shelby Lynne's concert was in the top two or three concerts of the year at the Narrows. Probably number one in the eyes and ears of your humble blogger. Kris Delmhorst, one of the first musicians ever to play the Narrows, returned Friday night with a bagful of new songs and a collaboration with opener, Meg Hutchinson (right, in above photo). The show was streamed live on mvyradio.com, by the way. Meg, a first-timer at the Narrows, also brought a bagful of songs and delivered a moving rendition of "America the Beautiful" which deserves to be airing on Americana radio stations across the USA (maybe mvyradio.com can grab it off the recording made of the show). Narrows prez Patrick Norton recalled that Kris was the 4th artist ever to perform at the Narrows. Her first show took place on an extremely snowy night 7 years ago. That also was the first time your humble blogger ever volunteered at the Narrows. So as Kris pointed out onstage "we grew up together." It was a night of beautiful voices, lush songs (for someone with just a guitar), and positive vibes. Tim O'Brien brought his relaxed rootsy sound to the Narrows Saturday night to a packed house. Tim played solo this visit, which probably allowed him to interact with the audience a bit more and do things on a whim. Opener Jimmy Ryan warmed things up. Above in the photo, Tim (left) and Jimmy do some pickin' "backstage" at the Narrows. Thursday night at the Narrows was a celebration of surf music, starring Los Straitjackets (above) and Laika and the Cosmonauts (below), a Finnish band calling it a career over the next few days after decades in the business. We were slightly surprised at the strong turnout by the local folks. Goes to show that the surf sound is still making waves in these parts. The Providence Journal did an interview with the group, which you can link to here. (By the way, Laika and the Cosmonauts used the Los Straitjackets' drum kit, which is why it says "Los Straitjackets" in the photo below.) Apparently a Finnish television station was videotaping everything, so we hope that the folks in Finland will soon be learning about the Narrows. We should point out that Los Straitjackets always wear masks on stage, so the Halloween season had nothing to do with their appearance. In the photo below both groups and management gather together for a "backstage" photo. That's Narrows prez Patrick Norton on the far right. The Narrows began a rare 4-in-a-row weekend Wednesday night, welcoming for the first time the Infamous Stringdusters. That's some of them in the photo below, cookin' up a storm with their bluegrass virtuosity. There's a show Thursday night, Friday night and Saturday night. Visit www.ncfta.org for more. As you may know, the Narrows is a 501 (c) (3) non-profit--a charity, in other words. As you might imagine--considering the economy--it's been tough sledding financially over the past month or so. Some of the shows have not drawn the audience they have in the past. The Narrows has had to pick up the difference when ticket sales don't cover costs. To help us get through these tough times, and to keep the music coming, please consider a gift to the Narrows. For more info, please click here. The California Guitar Trio brought their beautiful, disciplined guitar work to the Narrows on Thursday night. Your humble blogger emphasizes the discipline of their performance because they literally walk a tightrope during their performance--one false note, one hesitation can ruin a musical phrase. You gotta see them to believe it. These former students of Robert Fripp were streamed live on mvyradio.com and we hope the show will be available on that site permanently in the near future. Your humble blogger caught them on his camera "backstage" moments before their performance. Do Your Remember Rufus and the Moondogs? Do you remember Rufus and the Moondogs? One of the founding members helped make the Narrows restroom renovations possible, as noted on the above plaque. Did you know (I didn't) that Shelby Lynne--coming to the Narrows very soon--played Johnny Cash's mother in the fab movie Walk the Line? Hey! You Don't Play It That Way! We don't know if you call The Iguanas' music Tex-Mex, rock 'n' roll, jazz or what have you--it was a load of booty shakin' fun Friday night at the Narrows. And did the crowd dance! As you can see from the photo above, The Iguanas will do practically anything to get the sound they want! Don't miss these guys from the Big Easy next time! By the way, the show was streamed live by our friends at mvyradio.com and we hope it will be archived on their site in the near future. If you've been following this blog, you already know that the Narrows recently held a benefit for the Olson family. Musician Jeff Olson had a close call with Legionnaire's Disease, which put him into a 10 day coma and stuck him in the hospital for several months. He's home now, but still unable to work. However, he should be back in the swing of things in December. "I want to express my gratitude to the folks at the Narrows as well as all the members of my 'real' and musical families for making the benefit last Sunday a great success. The Narrows is a first class facility with a premiere sound system. It costs money just to open the doors and someone has to give up their time to run the sound and handle the concessions and do the introductions. "In addition to raising some badly needed money which will help retire our massive medical debt I was personally gratified that so many people contributed to the auction. We gave away some very valuable merchandise including a Baby Taylor guitar and a custom made drum by Ken Lovelett of American Percussion, an exotic bottle of wine and many other fine offerings. Barbara Kemper deserves most of the credit for getting out there and soliciting these donations as well as organizing the auction at the benefit. She worked long and hard on this and has my undying gratitude. Others who helped were Vincent Pasternak, and RISA (Rhode Island Songwriters Association) co-chair John Fuzek who peppered the RISA crowd with emails and contributed to the auction. "Finally, when Donna first told me that our good friend Rick Bellaire was putting this together I was a bit overwhelmed. Apparently Rick and (Rick's wife) Carleen along with Vincent and Elizabeth Pasternak, Barbara Kemper, you and (Narrows prez) Patrick Norton started planning this when I was still in a coma. I am very glad that I was able to cooperate and live long enough to attend. Much of the credit for me being there has to go to (Jeff's wife) Donna who refused to let me die and made sure that everything was being done to keep me breathing." Should have mentioned in the previous blog report that the Moonalice show was streamed live on mvyradio.com. They have streamed live a number of our shows this year, and recorded them, posting them on the site. Jim Lauderdale's and the Holmes Brothers' shows from the Narrows Festival for the Arts are currently posted and there are several others. To go directly to the Narrows' page at mvyradio.com, click here. Your humble blogger apologizes for not getting stuff about Friday's show with jammers Moonalice up on the site until Sunday morning. Man, it was a late show on Friday night, as G.E. Smith (who led the Saturday night Live Band for years) seemed to get hotter and hotter on the guitar as the hours went by. Above, that's a photo of G.E. sitting in on bass, flanked by group founder Roger McNamee's wife, Ann, lead and harmony vocalist. According to a January, 2008, article on portfolio.com, Mr. McNamee is a super smart investor type who has done well financially--and is a longtime lover of the Grateful Dead et. al. "After years of playing music for fun, McNamee says he's dead serious about making Moonalice work as a business." If you Google his name, you'll pick up a lot more about McNamee, who happens to be a very nice guy and not a bad musician. He's also been a financial advisor to the Dead, and counts Bill Gates, Steve Jobs and Bono among his friends. Anyway, G.E. Smith's guitar prowess was undeniably the anchor for the show. He was joined by Pete Sears, formerly of the Jefferson Starship, and other musical pros. Mr. McNamee, on bass below, and friends, by the way, have a CD coming out soon produced by T-Bone Burnett. The Narrows Sunday afternoon hosted a fundraiser for musician Jeff Olson and his family to help them overcome the financial whack of his damn-near-bought-the-farm illness over the summer. Jeff, guitarist/singer/composer for Folks Together, came down with Legionnaires Disease and was likely to be a goner--your blogger kids not--but his wife Donna, up above with Jeff, stood by her man the whole time, making sure the health system didn't snuff him by accident or neglect. Your humble blogger witnessed firsthand her feistiness with the medical establishment, making sure Jeff got the care he needed. Jeff, by the way, went into a coma for something like ten days, and lost use of his hands, legs etc. after he woke up. Slowly but surely his physical abilities have been coming back; he can walk a bit, although he still has a wheelchair/walker, and was able to play guitar fairly well during the show. Speaking of the show, one of Jeff and Donna's sons, Matt, 18, showed that he knows his way around the guitar and banjo, and is a promising singer and writer as well. That's him below playing with his group the Dyke Street Boys. Below, Rick Bellaire, who organized the benefit concert, strums his guitar during the Folks Together set. Rick, a wonderful writer and performer, did a great job bringing everyone together and making the afternoon flow smoothly. Other performers included Fred Wilkes and Michelle Wilson, Frank Gotwals, Mary Whelan, Dan Lilley, and Chris and Diane Myers. Patty Larkin graced the Narrows with her wonderful songs, humor, and instrumental prowess Friday night. It was her first visit to the Narrows, although she lives about 45 minutes away on Cape Cod. The show was streamed live on mvyradio.com and will likely be posted on that site in the near future. 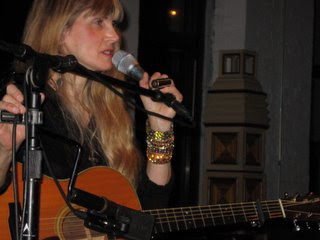 Rory Block makes her return to the Narrows January 10. If you haven't seen her, and dig acoustic blues, this show is for you. Students of the guitar--a must see. 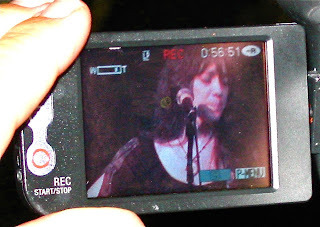 The photo is her performing at the Narrows. Harmonica players--James Cotton returns March 7. Details should be posted soon at www.ncfta.org. 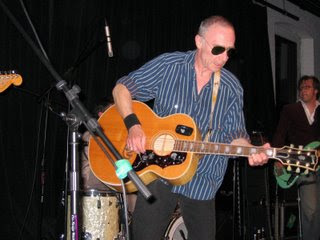 It's been more than a year since we last hosted Graham Parker. The photo above is from his spring 2007 appearance at the Narrows. He'll be back on our stage October 25. For more info, visit www.ncfta.org. Folk pop duo The Kennedys got the crowd a-smilin' Saturday night at the Narrows, bringing their good vibes and infectious 60s' style approach to music to a stormy night in the Northeast. They may lean retro, but make no mistake--they are solid performers, with Pete exhibiting guitar virtuosity and Maura showing impressive vocal styling. Your blogger also is impressed by their entrepreneurship, releasing many CDs and hosting a Sirius radio show. Justin Townes Earle, the twenty-something son of the great Steve Earle, showed that he's got his daddy's songwriting gift Thursday night at the Narrows. The 6'3" or so gangly dude with the slicked back hair is somewhat scary at first--smoking outside the Narrows before the show with eyes that have perhaps seen too much. And pacing onstage when his sideguy takes a solo--bending and twisting like a punk rocker or maybe Johnny Cash on a bender. But then you notice that he's not angry; nope, he's smiling, happier than heck to be playing for you, acknowledging applause with a down home "Thank you all!" He sings as if he's lived every lyric and then some, leaning down into the microphone 1950s rural radio broadcast style. No question: one of the best shows of 2008. Keep an eye on this youngster! Musician Jeff Olson is home and recovering reasonably well from his near-death experience from Legionnaire's Disease. He is healthy, but as of yet can only walk a few steps. I watched the Patriots at his house yesterday with him along with Folks Together bandmate Vinnie Pasternack. Jeff, of course, was disappointed with the Patriots' loss, but he feels fortunate to be around. This whole health thing has been a tough fiscal blow for the Olson family, so the Narrows is hosting a fundraiser on Sunday, October 5, 1 p.m.
By the way, thanks to Philippe and Jorge in the Providence Phoenix for the recent blurb about Jeff. Cheryl Wheeler, with her base in nearby Swansea, MA, had the Narrows laughing Saturday night as she played her annual concert at our beloved venue. Some news, particularly for Cheryl fans: she's recording a new album! Other stuff: she's dismayed about the political situation (of course! ), she loved the overcast weather in August (inspiring her to write a new tune), she's dreading her flight to Houston next week ('cause flying hasn't been enjoyable since the 1950s), and she urges her fans to support the Narrows Center for the Arts (thank you, Cheryl!). A regular reader of this blog suggested I add more "behind the scenes" stuff. Okay, here's some dirt: before the show Cheryl quietly sat in our "green room"; and moments before showtime helped me find the switches to turn on the ceiling fans. Yep, it's fascinating! We look forward to Cheryl's next visit! "If you must keep talking, try to make it rhyme..."
The bridge between jazz and blues (and a damn funny songwriter) Mose Allison brought his piano stylings to the Narrows on Friday night for the first time. "When I discovered Mose Allison I felt I had discovered the missing link between jazz and blues," says Ray Davies. This 80+ year old hep cat with a voice of a 35 year old jive talker kept a packed house hanging on every dry-witted lyric, like the one your humble blogger is using as the headline. That's from Mose's song "Your Mind in on Vacation But Your Mouth is Working Overtime," a favorite of mine (and of Van Morrison and Elvis Costello, who covered it). "If talk were criminal, you'd lead a life of crime. 'Cause your mind is on vacation and your mouth is working overtime." Mose posed below with his bassist, Paul DelNero, in the Narrows "green room" shortly before the performance. That guitar pick above is an official Tom Rush pick, something he gave away to an unexpected donor of $1,000 Saturday night at the Narrows. That's the kind of guy Tom is. Your humble blogger, during his usual introductory remarks before bringing the featured performer on stage, noted that the Narrows now has a WALL OF RECOGNITION, for donors at various level of giving. Tom, who has been very generous to the Narrows himself, offered--tongue squarely in cheek--- to give away his official pick to donors. People laughed, but heck a little while later a generous donor stepped forward. As always, thanks Tom! A sold-out crowd delighted in Tom's music performance of course, which was streamed live on mvyradio.com. And Tom spent quality time with the fans signing autographs and chatting with folks who, no doubt, have been following his career since his early days in Cambridge, MA.